Mercedes-AMG is back once again to redefine what we called a sedan. The tuning arm of Mercedes just announced its E 63 4MATIC+ and E 63 S 4MATIC+, and they make every other over-powered sedan out there look cute and cuddly. The E 63 4MATIC+ and E 63 S 4MATIC+ is what Mercedes-AMG refers to as the most intelligent executive saloon out there. Mercedes-AMG is setting new benchmarks in this segment by utilising its intelligent drive strategy, which allows AMG to raise the performance limits of the vehicle’s dynamics. The Mercedes-AMG E 63 S 4MATIC+ is the more powerful one out of the two with the same 4.0-litre V8 tuned to generate 612HP with 850Nm of torque, while the Mercedes-AMG E 63 4MATIC+ is the standard version with 571HP on tap. The exterior design gets an aggressive-looking overhaul featuring a new radiator grille and coupé-style inset bonnet. What you get under the hood is a 4.0-litre twin-turbo V8 engine which generates up to 612HP and it also happens to be the most powerful engine ever to be installed in an E-Class. The S‑Model completes the sprint from 0 to 100 km/h in 3.4 seconds, whilst the E 63 4MATIC+ takes 3.5 seconds. Something that one does not hear when it comes to powerful vehicles is efficiency, oddly this E-Class has a few tricks up its sleeves. This is thanks to a cylinder deactivation system that comes fitted as standard. You also get the AMG SPEEDSHIFT MCT (Multi Clutch Technology), a nine-speed sports transmission, which allows for more agile response times. And all of this power is put down to the road with the help of the AMG Performance 4MATIC+ all wheel drive system. “The new E 63 models represent the biggest step forward we’ve ever taken from one generation to the next. Vehicle dynamics were especially important to us. At the start of the development process, we opted for a fully variable all-wheel drive system which, when combined with the advanced performance of the 4.0-litre twin-turbo V8 engine, reaffirms our brand’s “Driving Performance” claim,” explains Tobias Moers, Chairman of the Board of Management of Mercedes-AMG GmbH. Mercedes-AMG is back once again to redefine what we called a sedan. The tuning arm of Mercedes just announced its E 63 4MATIC+ and E 63 S 4MATIC+, and they make every other over-powered sedan out there look cute and cuddly. The E 63 4MATIC+ and E 63 S 4MATIC+ is what Mercedes-AMG refers to as the most intelligent executive saloon out there. Mercedes-AMG is setting new benchmarks in this segment by utilising its intelligent drive strategy, which allows AMG to raise the performance limits of the vehicle’s dynamics. 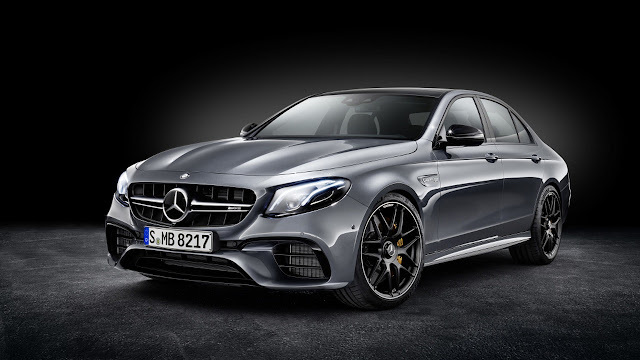 The Mercedes-AMG E 63 S 4MATIC+ is the more powerful one out of the two with the same 4.0-litre V8 tuned to generate 612HP with 850Nm of torque, while the Mercedes-AMG E 63 4MATIC+ is the standard version with 571HP on tap. The exterior design gets an aggressive-looking overhaul featuring a new radiator grille and coupé-style inset bonnet. What you get under the hood is a 4.0-litre twin-turbo V8 engine which generates up to 612HP and it also happens to be the most powerful engine ever to be installed in an E-Class. The S‑Model completes the sprint from 0 to 100 km/h in 3.4 seconds, whilst the E 63 4MATIC+ takes 3.5 seconds. Something that one does not hear when it comes to powerful vehicles is efficiency, oddly this E-Class has a few tricks up its sleeves. This is thanks to a cylinder deactivation system that comes fitted as standard. You also get the AMG SPEEDSHIFT MCT (Multi Clutch Technology), a nine-speed sports transmission, which allows for more agile response times. And all of this power is put down to the road with the help of the AMG Performance 4MATIC+ all wheel drive system. “The new E 63 models represent the biggest step forward we’ve ever taken from one generation to the next. Vehicle dynamics were especially important to us. At the start of the development process, we opted for a fully variable all-wheel drive system which, when combined with the advanced performance of the 4.0-litre twin-turbo V8 engine, reaffirms our brand’s “Driving Performance” claim,” explains Tobias Moers, Chairman of the Board of Management of Mercedes-AMG GmbH.